INCAN KING sadly died in the Autumn of 2011. We are so proud to have owned him and have his genetics in our herd. We have male and female progeny who are stunning and will be a very important part of our breeding programme. Incan King stood out in a crowd, but not because of his glorious colour. This male exuded high quality from the tip of his toes right through to the end of his nose. A multi championship winner in the American show circuit he added coloured genetics in the UK, the like of which we could only have dreamt of a few years ago. With an astoundingly beautiful phenotype, married to the most sumptuous of fleeces this male left all who saw him in awe. 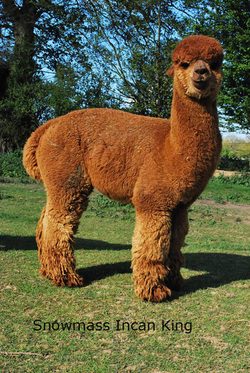 His fleece exhibited tremendous organisation, was beautifully soft handling, very dense, fine and bright and with the most impressive of crimp styles, all in a 5-year-old male. With bloodlines stretching back to all of the American greats. We have prize winning progeny from this male for sale.